To verify the accuracy of test kit and determine a correction factor to continue using the test. NP-Standard: For checking nitrate and phosphate tests. 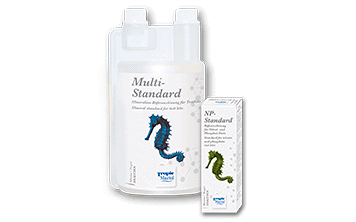 Multi-Standard: For checking calcium, magnesium, alkalinity and potassium tests. Useable with all Tropic Marin® test kits, as well as all common tests.